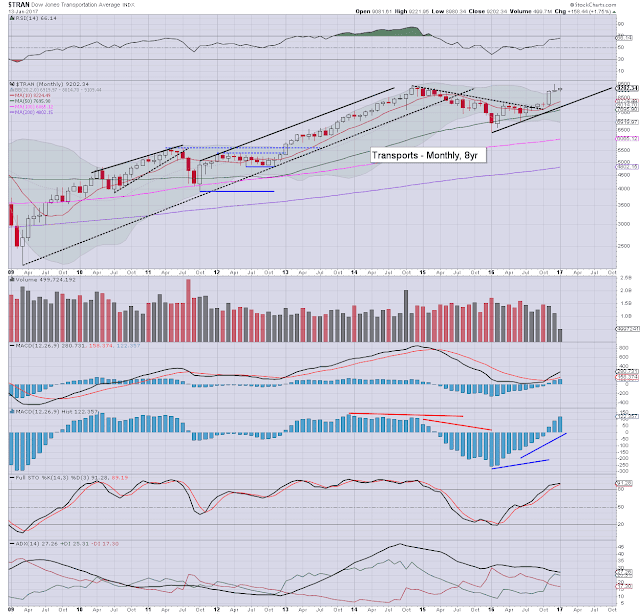 The upward trend in US equities continues, as the market is still regularly breaking new historic highs. 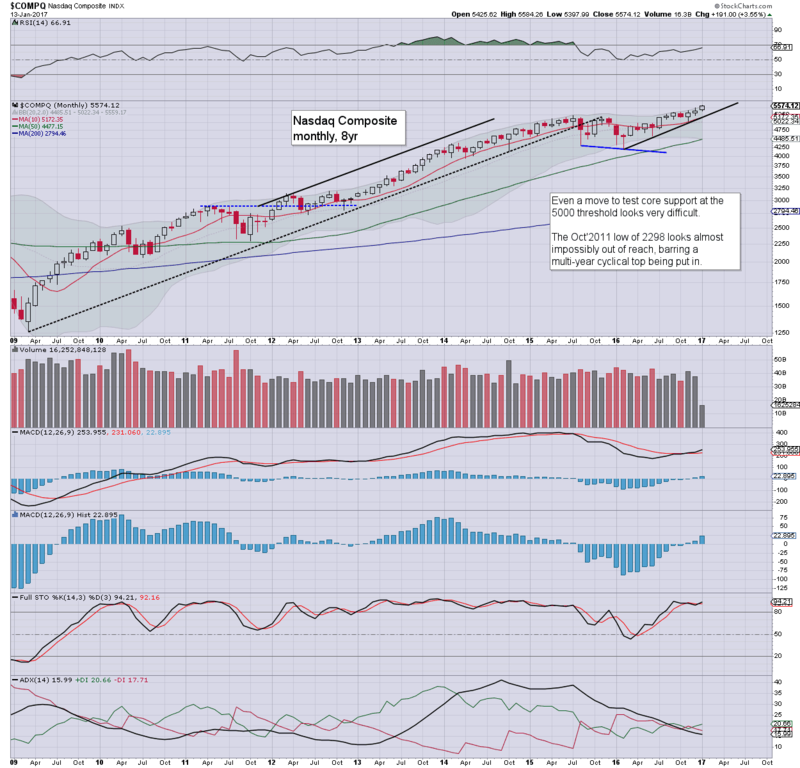 Leading the way is the Nasdaq comp', now in the 5500s... with the 6000s due. The Dow is set for 20k, along with the sp'2300s. 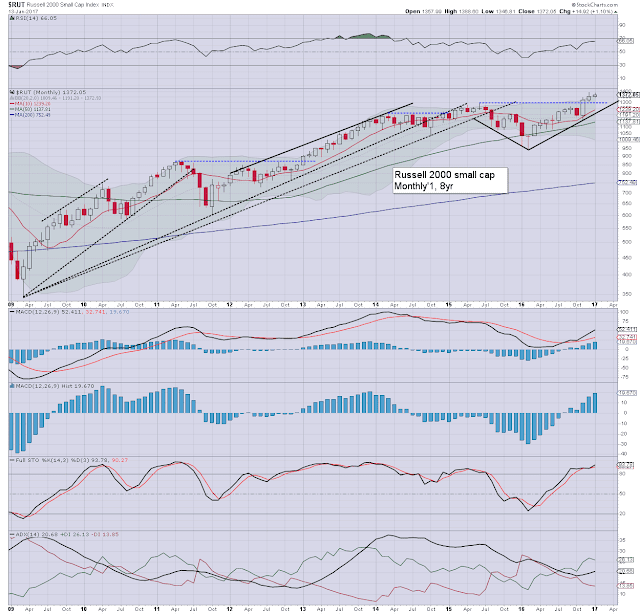 The broader outlook remains bullish, with a basic target of sp'2400/500s by end 2017. It is notable that the sp' has already managed a new historic high of 2282 this month. Underlying MACD (blue bar histogram) continues to tick higher. 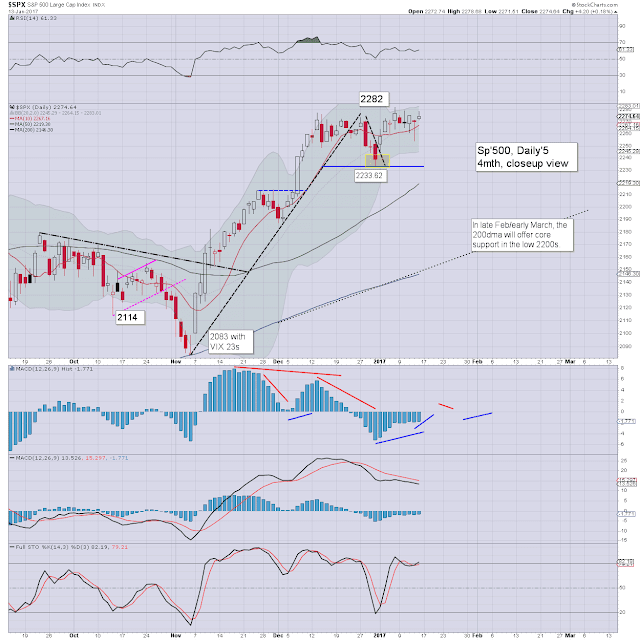 The key 10MA is currently @ 2161, and will be in the 2200s this spring. The election/Nov'2016 low of 2083 looks unlikely to be tested this year. The hyper bulls - those who believe no recessionary/geo-political problems for at least another three years, should be seeking the MACD to break the momentum high seen in Nov'2014. That won't be easy though, and I'll be looking for a divergent lower high in momentum, whether late this year, or more likely.. early 2018. 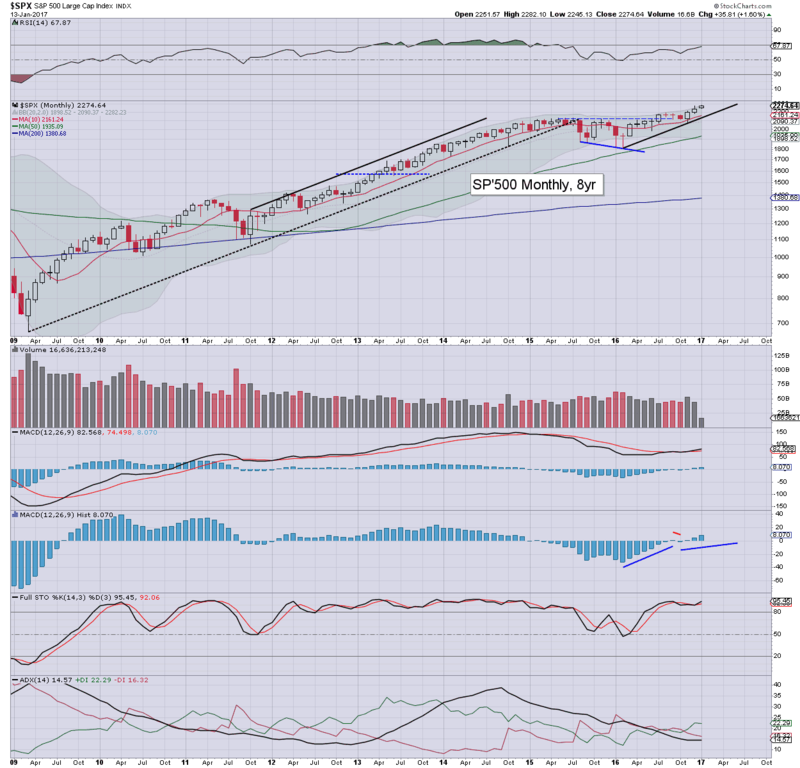 I recognise that some are seeking a major correction of 20/30% - to the sp'1800/1500s, later this year. That looks extremely difficult though, as the Trump economic train is arguably only just leaving platform 8. Further, commodities look set for broad gains, with the CRB on track for 280/300 - from the current 190s. 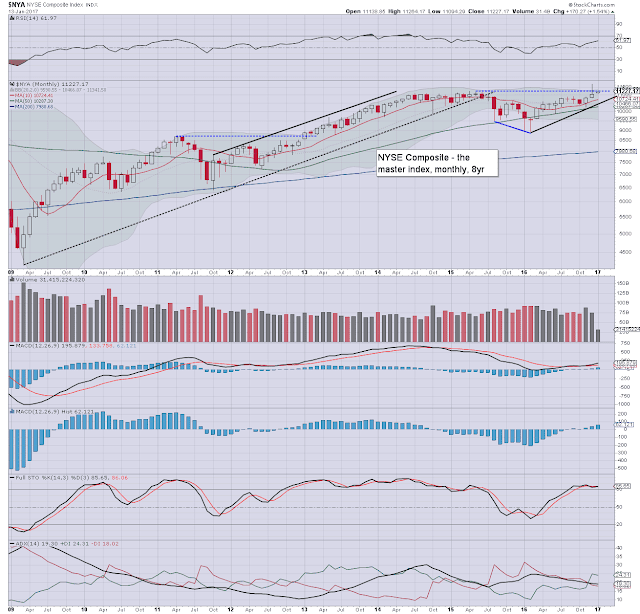 If correct, its impossible to see the sp' not pushing to at least the 2400/500s. My own 'best guess' for the year end close is 2683, but that does assume no corrections/retraces greater than 10%. 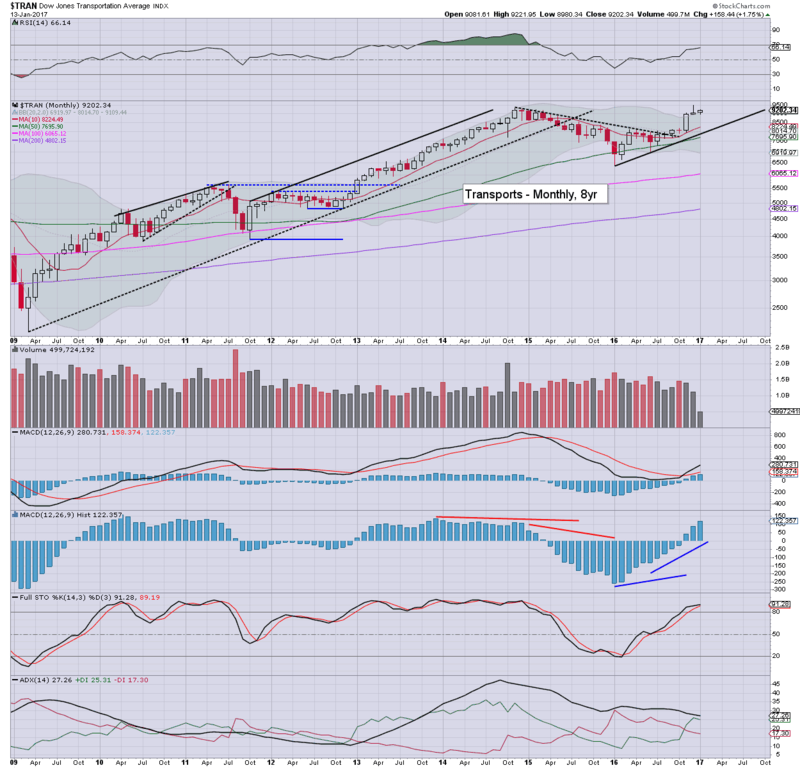 The Nasdaq comp' is leading the US equity market higher, regularly breaking new historic highs. Core support remains at the giant 5K threshold, with the 10MA now in the 5100s. 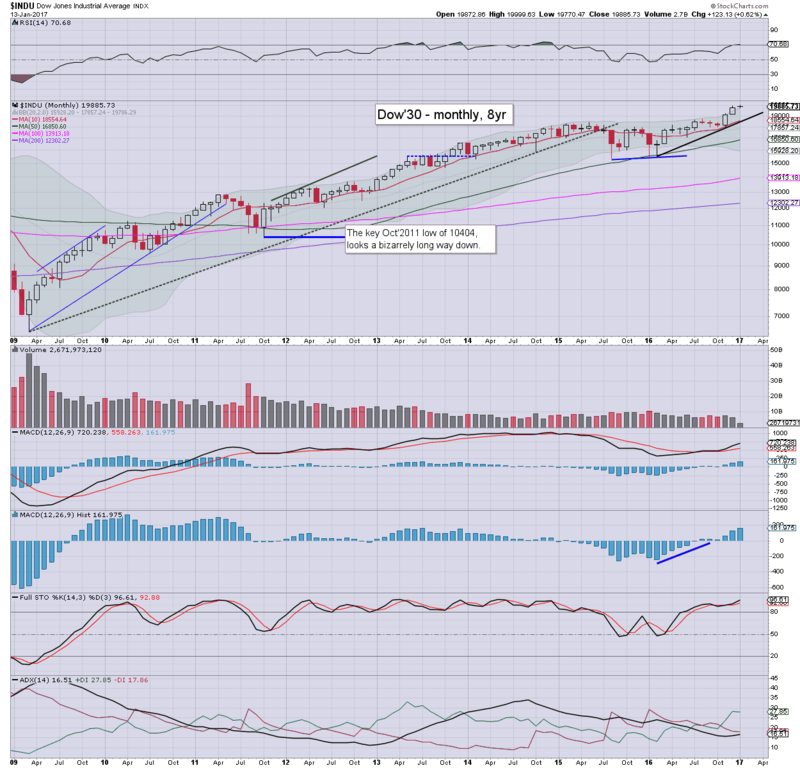 The 6000s look a realistic target for late spring/early summer. When will the mainstream start to talk about Nas' 10k ? The mighty Dow recently came within 0.37pts of the giant psy' level of 20k. That level does look set to be broken within the near term. Most recognise, any daily close >20k, offers another basic 400-600pts of upside, before the next realistic opportunity of a minor correction of 3-5%. Core support remains at 18k, with soft support at 19k. Its an interesting thought that just 15% of upside in 2017 will take the Dow to around 23k. *the spike for the Dec' candle in the 11600s is a 'rogue/false print'. The master index continues to grind upward with a new high of 11264. Next big target is the 12k threshold, which seems a valid target by May. A year end close in the 13000s seems possible. The second market leader - R2K, continues to power upward, currently a little below the Dec' high of 1392. 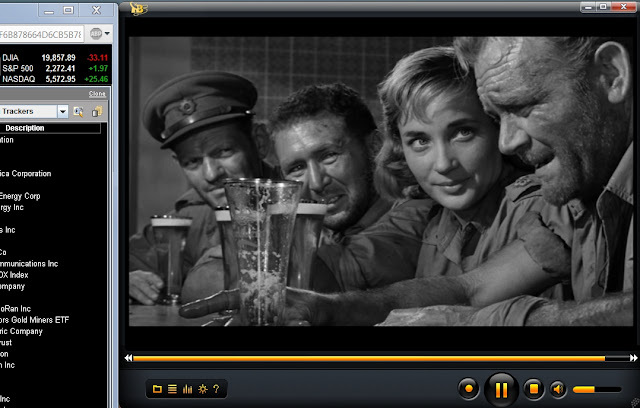 Upper bollinger will soon be in the 1400s. The 1500s appear due by mid year. 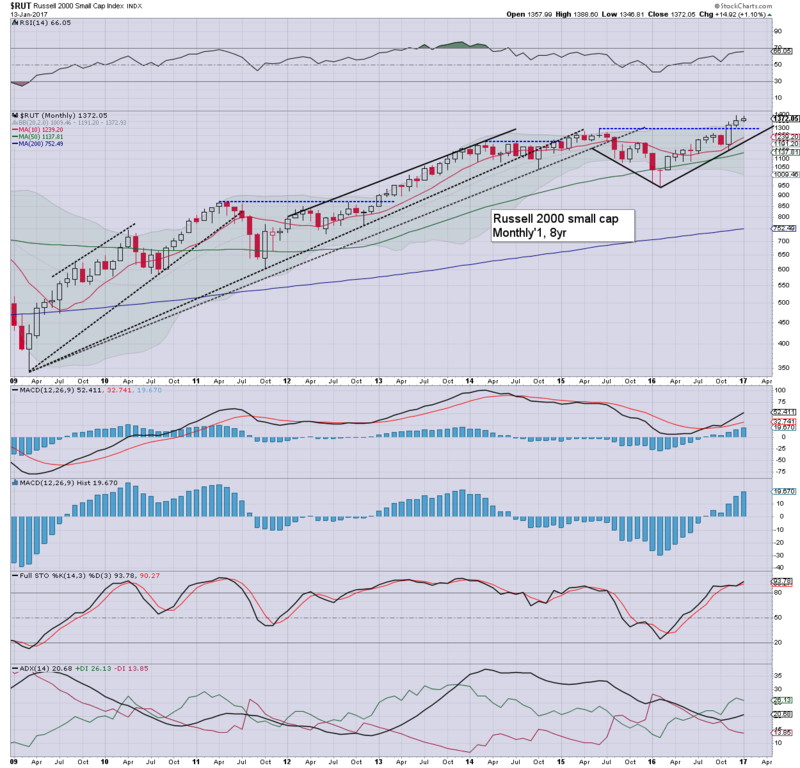 Things only turn provisionally bearish if the R2K is trading <1300 in June or beyond. The 'old leader' - Transports has cooled a little from the Dec' high of 9490, but is still broadly climbing... currently scraping along the upper bollinger. The giant psy' level of 10k looks due this spring. If WTIC oil can break and hold >$60 by the summer, it will be a downward pressure on the transports.. even if the main market remains super strong. All US equity indexes continue to climb from their Jan/Feb' 2016 mid term lows. 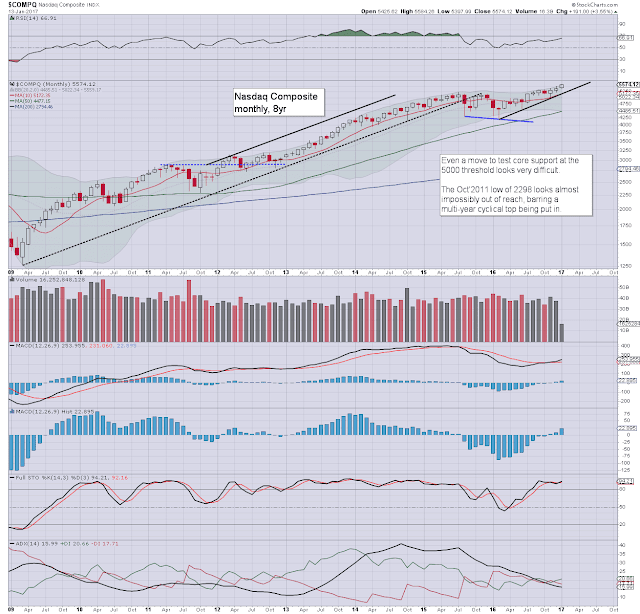 The Nasdaq comp' is leading the way higher, with even the Transports now broadly strong. Equity bulls have around 10% of downside buffer before core support is tested. 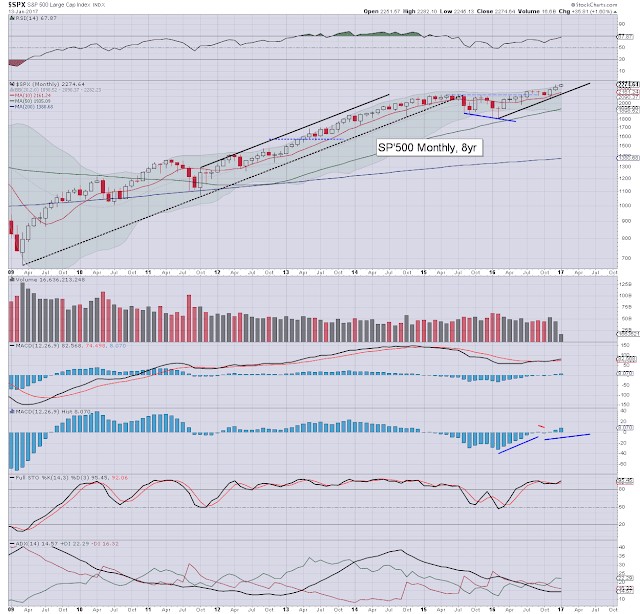 The equity bears have nothing to tout, unless a monthly close under the 10MA, which this spring will be in the sp'2200s. Friday will see the inauguration of Trump, as 45th President of the United States. Clearly, the market will be effectively flat-lining as everyone merely sits back and watches the event. Further, the fact it will be opex, will mean the typical choppy price action will be especially muted. 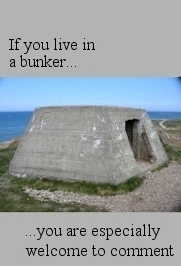 **there are a number of fed officials on the loose. Notably Yellen, who will be stalking the west coast across Wed/Thursday. US equity indexes closed moderately higher, sp +4pts @ 2274. The two leaders - Trans/R2K, settled higher by 0.6% and 0.8% respectively. 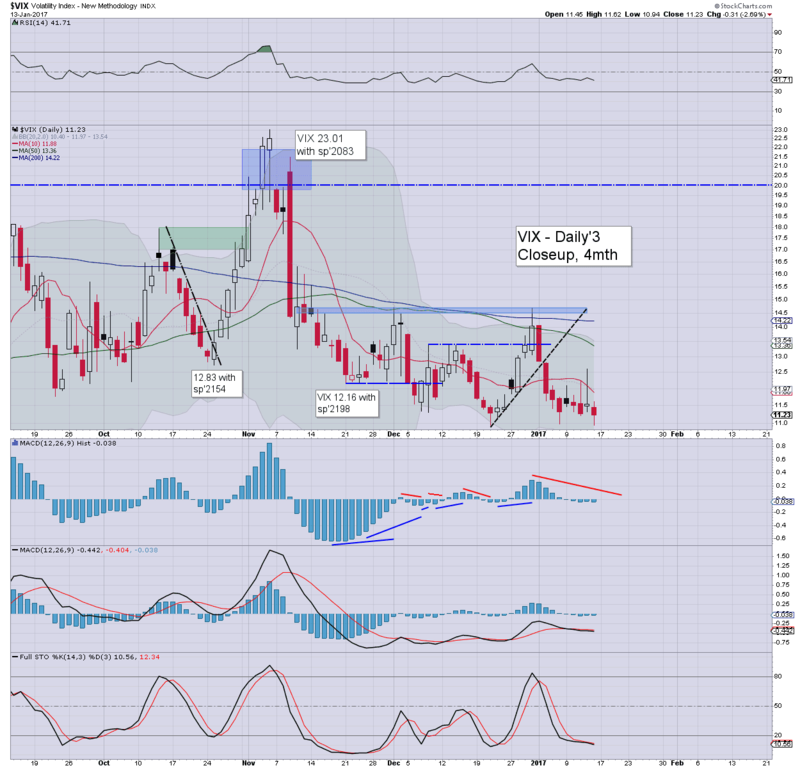 VIX settled -2.7% @ 11.23. 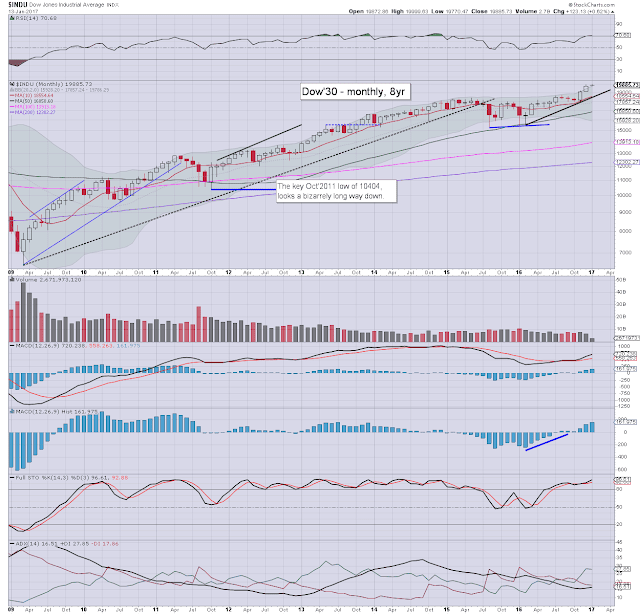 Near term outlook offers upside of another 2-3%, before next realistic opportunity of sig' cooling to the mid/low 2200s. 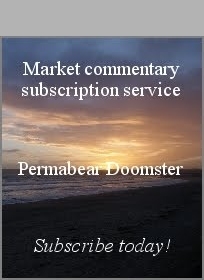 US equities ended the week on a naturally rather subdued note. 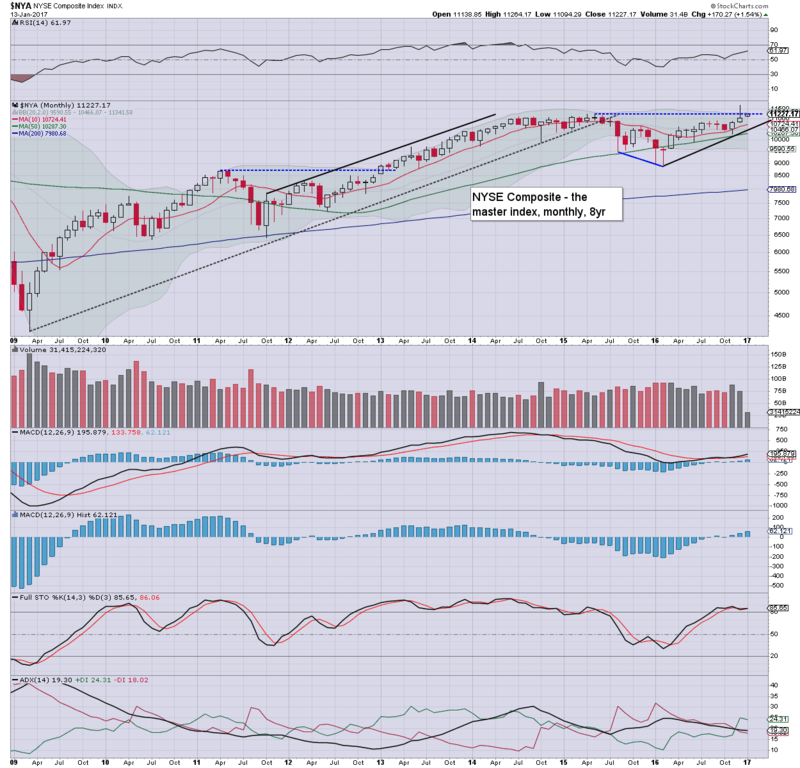 It was however very notable that the Nasdaq comp' broke yet another new historic high. With no real equity downside power, the VIX remained subdued, briefly trading in the 10s, but settling in the low 11s. There were further large blocks of VIX Feb' calls bought, as some are understandably of the view that the equity market is due for a sig' retrace, something on the order of 3-5%... no later than mid Feb.